This is easily the best, spongiest and the yummiest vegan cake that I have made so far. 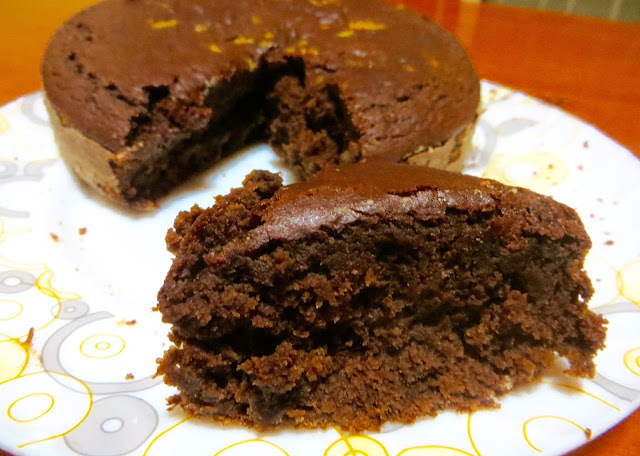 The right amount of sweetness, chocolaty goodness, and the tanginess of oranges, perfect!! A very easy recipe, and the same batter can be used to bake muffins as well. I have used sugar in this recipe, however it can easily be made sugar-free by substituting it with the same quantity of palm sugar or jaggery powder. I have also used peanut curd in this recipe, however feel free to use any vegan curd. I get wonderful, thick, delicious peanut curd from here : www.veganarke.com. Bangalore vegans do try their curd and amazing almond milk once, you will become a regular consumer of their products :) The best part is that it is so reasonably priced, that I lose any motivation to make my own vegan curd or milk! Lucky me! So here is the recipe for this decadent treat! In a bowl, sift together the dry ingredients : whole wheat flour, corn flour, cocoa powder, baking powder and baking soda. In another bowl, mix nicely using a wire whisk, the vegan curd, oil, banana pulp, orange juice, vanilla essence and orange zest. Add sugar little by little, and keep mixing. Now fold in the sifted dry ingredients into this. If the batter is a bit dry, add little warm water and mix well. Do not over mix/whip the mixture. Only fold the batter gently. Pre-heat the oven. Grease and dust a cake pan. Pour the batter into the cake pan. Bake for 25-30 minutes. Bake at the temperature settings of your OTG that you usually use to bake cakes. Check if done with a toothpick. Let the cake cool. Remove gently, and drizzle some more orange juice on top. The cake is very yummy as it is. If you wish you may add some ganache or frosting, decorations or chopped nuts of your choice on top of the cake before serving.